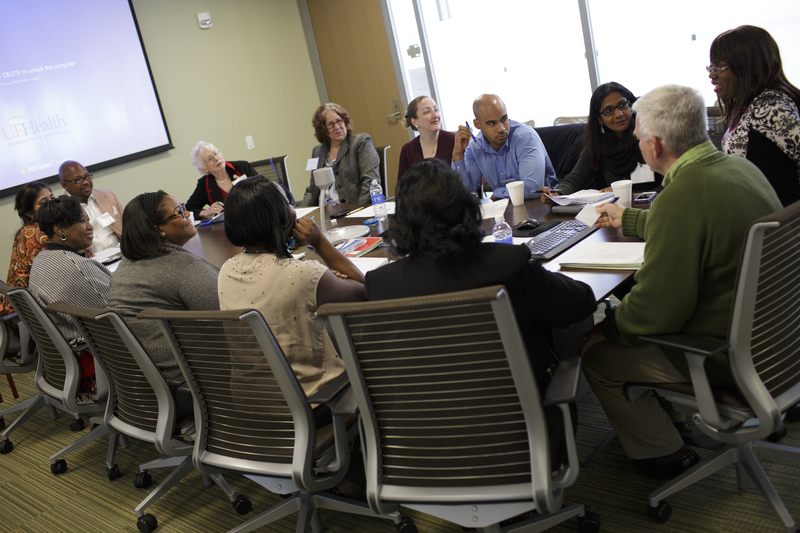 Community Advisory Board members meet at the Clinical and Translational Research Building in December 2014 to review CTSI strategic goals for the next five years. The UF Clinical and Translational Science Institute’s Community Advisory Board advises the CTSI and its Community Engagement and Research Program on specific research projects and translational research goals, with meetings rotating between Gainesville and Jacksonville. Read below to learn more about the board’s mission, vision, goals, members, governance and how to get involved. Ensure the community has a voice in the direction and access to the actions, activities and initiatives of the CTSI as it implements and transforms research at the University of Florida. Partner with the University of Florida to have a positive impact on health issues in the community while assuring community research represents local community interests. To learn more about getting involved, please contact Dr. Linda Cottler at lbcottler@ufl.edu.